We've had some previous posts about the benefits of the new Bamboo fabrication from New Balance, but I had to post again about the new men's and women's Bamboo Biocool® Tee that just arrived on NBwebexpress.com. 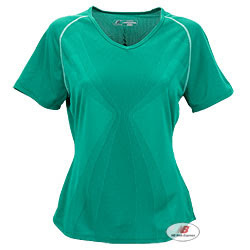 A good technical tee is important for training runs, but a tee can't do any good if it's not comfortable. So, the Bamboo Biocool® Tee is the best of both worlds; it's very technical with Biocool® body mapping (moisture wicking technologies that target core heat zones) and the cutting edge Bamboo fabric, but still comfy against your skin with a soft feel. Check out the new colors for spring, too. They are bright, vibrant and bold, just in time for warmer weather...at last!